Here we are, more than halfway through the second Mallorca Experience Tri Camp and taking a lighter, rest day - supposedly. It's been a great experience so far. With a larger group of twenty to look after and coach the challenge has been ensuring a much wider spread of abilities and ambitions are all provided for. This has also meant tight turnarounds on getting three groups of swimmers into the pool over the two hour slot we have - and still ensure time for a big breakfast - followed by minimum faffing around to get out on the bikes and still leave time for a run, stretch session or a soak in the spa. We kept to the daily swim routine this morning, with the focus today all on initiating a powerful catch and pull and then some higher intensity intervals. The first small group started the session with steam rising in the chilly morning air and Coach Leanne and me all wrapped up to keep warm. Group 2 had a slightly shorter set, the sun's rays warming us up and some of my layers coming off. By the time Group 3 were in and completing their session I was down to my polo shirt, joggers and sunnies - can an environment for swim coaching be any better? Our daily routine has been to then get on the bikes to enjoy the wonderful routes. It's been great having Leanne and Tom to share the guiding and coaching. Tom has been leading one harder core group up and down every climb we had plotted out for them - yesterday's including the famous Sa Colabra. We've then split us three coaches between two other groups on the roads. 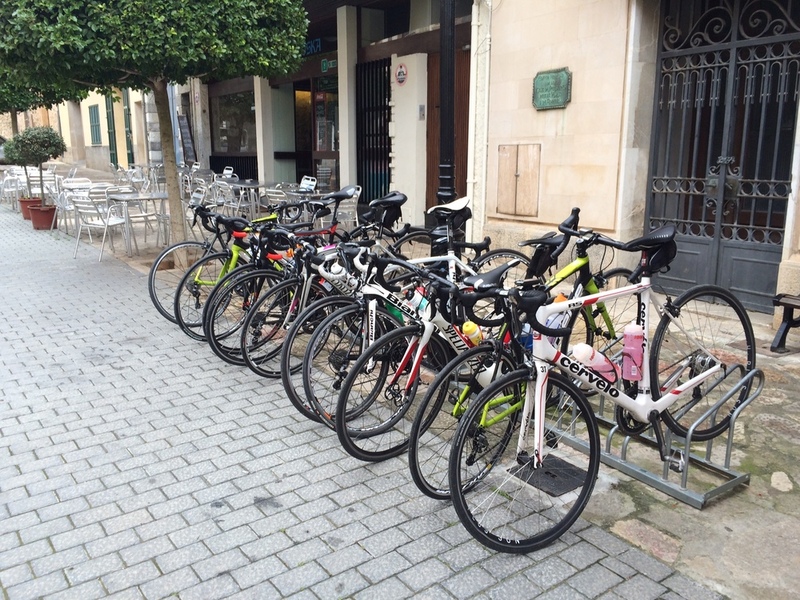 Both groups often covered the same distances and routes but at a different pace and with more or fewer leisurely coffee stops, according to taste, energy and ability to spin out a good yarn. A big plus this week has been a Pilates and S&C class from Blue Koala physio Cathy and regular stretch sessions led by Leanne - much needed particularly yesterday after everyone's longest and highest rides in the mountains. And just to lead the way in recovery aids, it seems I currently hold the record for most complete immersion in the plunge pool followed by ice scrub. Today is meant to be a lighter rest day, for those on the Camp and us coaches, with just this morning's swim and an early evening recovery run in the schedule - but several have already set out for rides to keep their legs spinning and coffee consumption up. Bet they end up going further and faster.